Help cheer on the Childhood Eye Cancer Trust’s London Marathon runners! Come along and experience one of the greatest running events in the world – without the blisters, aches or many months of training. We are delighted to have 13 amazing people running in the Virgin London Marathon this year, all raising funds for CHECT on Sunday 26th April. But you don’t need to be able to run 27 miles to support CHECT at this Sunday’s marathon. We’d love you to help us cheer on our fantastic team along the route, so if you can spare a few hours between 11.30 and 4pm, we will give you a T shirt to wear and make sure you have enough refreshments so that you can make as much noise as possible! If you’ve never been before, it’s a great day out and London is buzzing with an electric atmosphere. If you’d like to join our cheering squad, call Fiona Heath on 020 7377 5578 or email fiona.heath@chect.org.uk before 5pm on Thursday 23 April and we’ll give you all the details. We’ll be standing between mile marker 20 and 21 – see below. 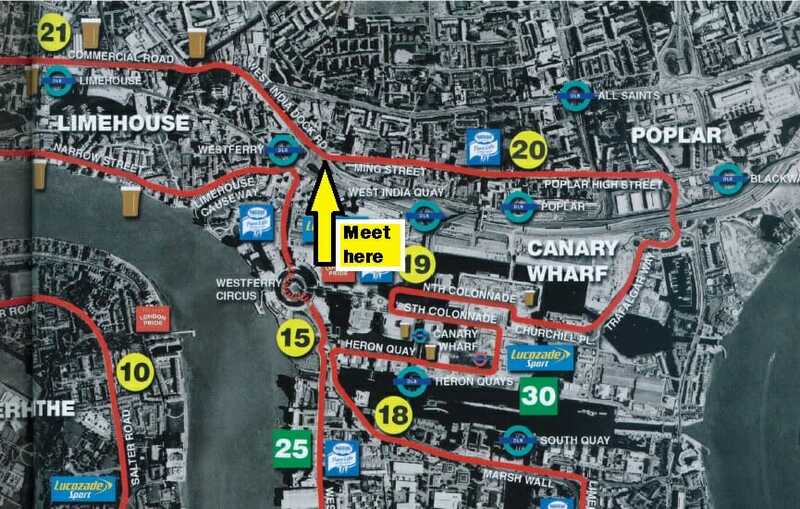 If you have family or friends taking part, this is a great location – you will be able to catch sight of the runners as they pass by WestFerry station at around 14.5miles, then move across the pedestrianised area just a few yards to catch them a second time at the CHECT supporter post. We will also be meeting and greeting runners and their family and friends at the end, where we will be located in Grren Park at the Inn on the Park, next to the runners’ rest area. We are very lucky to have such an amazing bunch running for CHECT this year. See below to find out who’s in Team CHECT and read their motivational stories by clicking on their names. We’re already collecting the names of those people interested in next year’s event. Let us know below if you’d like us to contact you with further information about securing a place in the 2016 London Marathon.